I had the pleasure of meeting with two very interesting gentlemen, Mr. Douglas McDonald and Mr. Luc Corneli. To better appreciate where they come from, it is important to understand that they are the Principals and Founders of one, if not the biggest, privately-held Canadian real estate empires. 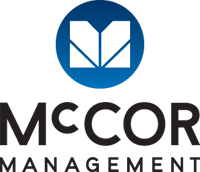 McCOR Management is a newly formed company–the result of a merger of two big names in the industry. In Western Canada, NewWest Enterprise Property Group with expertise mainly in commercial management, and on the Eastern side, HighPeak Realties with its expertise in project development and acquisitions. By joining their forces, they now offer a wide range of services to retail, commercial, and industrial clients. They use a proprietary system that they call their “secret’’ sauce. You are both Canadian real estate magnates. Please tell me more about your background. Luc: When I was younger, I helped my father operate the family restaurant. I slowly started to help him with the management of the building. I learned how to deal with tenants, manage cash flow, and deal with maintenance, etc. At this point, I understood that I wanted to make a career out of that. Doug: I kicked off my career right after finishing my Bachelor’s degree. I started in a real estate management firm, where I gained valuable experience. We met a few years ago, on the West Coast, as a result of a merger that did not work out. We both recognized the advantages that a merger could bring and, thus, initiated the process of merging our two large businesses. Forming a coast to coast firm is obviously a very laborious process. You have to be sure that the other party is the right fit, but also that there is synergy between the two. The overall process took about three years. You’ve built such an empire! You must both have a great deal of confidence! Confidence, absolutely! Although we are very successful, our vision keeps us grounded and close to our employees. Being supportive and making sure that everyone is treated fairly compels employees to thrive for the success of the business. Our motto is: you are as strong as your weakest link. What do you like most about real estate? It gets you going every morning! This is the only business in which you will learn on a daily basis. Real estate has the advantage of dealing with a lot of people, all of the time. I’m sure you’ve met many brokers in different fields. In your opinion, what do the best brokers have in common? I can assume that after all these years in the industry, you’ve come up with the perfect recipe for your investment process. Can you tell me about it? As a service company, it may be hard to achieve long term goals while only looking for results on a quarterly basis. The fact that we are not a public company enables us to have a longer term vision. Therefore, we are able to think outside of the box and offer innovative solutions to our clients. The road to success is obviously a very bumpy one. What is the greatest challenge that you have ever faced? Luc: My greatest challenge was deciding to resign from a VP position in order to follow my dream: building my own business. Not knowing whether you are going to make ends meet when you have a family can be very uncomfortable. Doug: My greatest challenge was quite different. Back when I acquired NewWest Enterprise, I had to integrate 300 employees within the operations of my firm. For the people reading the magazine, what would be your single best advice regarding pursuing a career in real estate? Doug: Learn and gain as much experience in all fields. Once you’ve reached a point where you are knowledgeable enough to understand the whole picture, it is now time to specialize in something that you will be better at than anyone else. Be the reference. Luc: Don’t make decisions based on monetary issues, base them on experience. Also, it is important to always remember that passion drives results, not the other way around. I understand that McCor Management is mainly focused on Canadian real estate. What is your opinion on international expansion? You have to learn how to walk before you can run. Aiming too big, too fast, can be the greatest liability. It can lead to failure. Besides business, what are you passionate about? Has anyone who has crossed your path truly influenced you? Our parents, and their values, have always been great influences. As businessmen, we’ve had several mentors who have groomed us along the way. They’ve helped us become the business people that we are today. It is so important to have someone with experience gained from years in the field. Now that we can do the same, we strive to take on that role with our employees. What is the best thing that money can buy? It enables us to enjoy life, to do things that we’d really like to do. Toys are indeed part of it, but only secondary. What is the best thing that money can’t buy? Money isn’t everything. Some things are priceless. The pleasure of spending time in a small country house in Italy or going to a hunting lodge, for instance.